TheGunBlog.ca — At least three Canadian government MPs and a staffer sought to associate the Conservative leader of the opposition, Andrew Scheer, with terrorism and mass murder because Carleton University’s Conservative club organized a range day today with an AR-15 rifle. 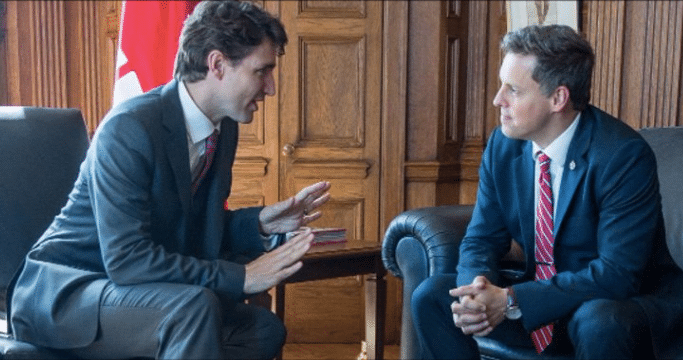 “Disappointed that @AndrewScheer’s Conservatives are fundraising off of the AR-15 which was used in the recent shooting in Christchurch, NZ,” Peter Schiefke, a parliamentary secretary to the prime minister and Liberal member of parliament in Quebec, said on Twitter last night. Schiefke assisted Minister Bill Blair last year in meeting with gun owners across Canada to examine the mass gun confiscations that Blair is now preparing. It's surprising to see your fake smear after you've just spent the past several months with Minister Bill Blair meeting safe and responsible gun owners across Canada. Your comment casts doubt on the value of the meetings and the intentions of your government. Blaming one person or group because of a random relation to another person or group is one of the most basic flaws of reasoning. The so-called “guilt-by-association fallacy” is a favourite tactic of firearm prohibitionists and genocidal tyrants seeking to scapegoat their enemies as a prelude to confiscation or extermination, or both. But it’s rare for it to be weaponized so dishonestly and personalized so directly. For more than a year, the Liberal government has promoted Bill C-71, its planned law against hunters, farmers and sport shooters, by suggesting a link between violent offenders and Canada’s 2.2 million men and women with firearm licences. The Liberals have failed to show any evidence of a link because none exists. The government is using the same tactic as it prepares mass gun confiscation from lawful owners. The slanderous attacks have angered gun owners across the country. Their rights to dignity, culture, heritage, protection, privacy and property are now critical election issues for hundreds of thousands of voters. The latest smears come after The Canadian Press quoted Liberal Prime Minister Justin Trudeau as telling supporters Feb. 1 his party would “stay positive” in the face of “negative, divisive campaigns” in this year’s election. 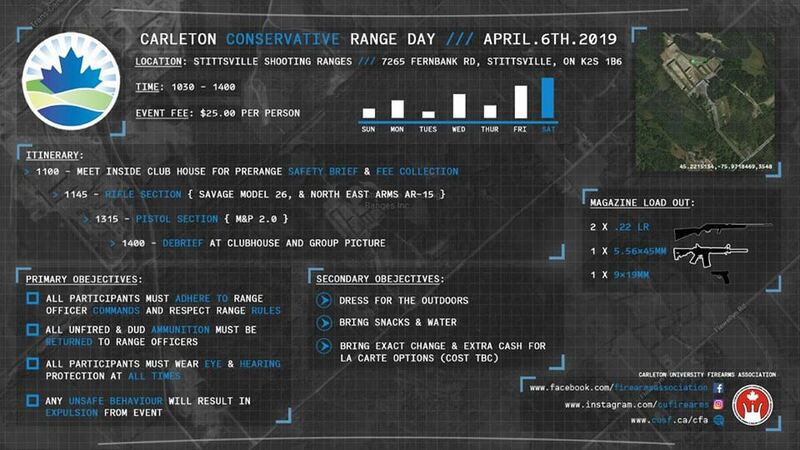 The Carleton Campus Conservatives in Ottawa published a Facebook invitation on April 1 for a range day today. It mentioned the chance to fire an AR-15, a popular rifle for Canada’s millions of shooters and one of the world’s bestselling firearms. Several other guns were also featured in the invitation. The event was at Stittsville Shooting Ranges, the same location as an annual Parliamentary Day at the Range for MPs and staff from all parties. Hunting and sport shooting are at the heart of Canadian culture and heritage. More Canadian men and women have a firearm licence authorized by the federal police than play golf or hockey. Ministry staff also jumped in. The three MP tweets had more than 750 replies as of 11 p.m. Toronto time today, almost all of them critical. TheGunBlog.ca also replied to Bittle and Vandenbeld. Update on April 8: “We are hoping to host other campus political parties at the range in hopes of educating students on safe firearms handling,” Kelvin Jiang, the vice president of the Carleton University Firearms Association, told TheGunBlog.ca by e-mail on April 8. The association is a member of the Canadian University Shooting Federation and said it ran the range day for the Carleton Conservatives. Does your fake smear contribute to healthier political discourse or safer communities? If you ever feel like experiencing the reality of the millions of Canadian men, women and youth who own or use firearms, happy to set it up. It's disturbing to weaponize a fake association to attack a fellow politician in this way. Hunting and shooting are at the heart of Canadian culture and heritage. If you ever feel like experiencing the reality of the shooting community, I'll set it up. Subscribe to TheGunBlog.ca’s private e-mail updates.